It’s been a little quiet for priests recently. Most of us are well on the way to finishing out tier bonuses and gathering trinkets (especially with the recent buffs made to the Auto-Repairing Autoclave and Elementalist’s Shielding Talisman). Much of the discussion in the debut priest column was around Void Entropy so I wanted to take a stab at that and see what could be done to make the talent more appealing. I can’t think of another class’s stat priorities which are as diverse as a shadow priest. Even the Icy Veins shadow priest guide shows that there’s no less than four different stat priorities for your priest which is strongly dependent on what you’re focusing on. Want to excel in every situation? You better start collecting as much varied and diverse gear as possible. Then again, back in the old days, I used to carry a set of PvP gear on me (for both healing and damage) along with PvE gear (for holy, discipline, and shadow). In a sense, it isn’t too different. This is one of the rare scenarios where reforging would apply since you can always reallocate your stats from something undesirable to something else that better fits the encounter requirements. Is that really fun though? I’m not sure if it’s fun or tiring to constantly have to reforge stats from one to another on each and every boss because I’m switching from AoEing, to single targeting, to single targeting with a light number of ads. Anyway, let’s talk about talents. Clarity of Power is just perfect the way it is. It offers something for the caster who needs to be mobile. 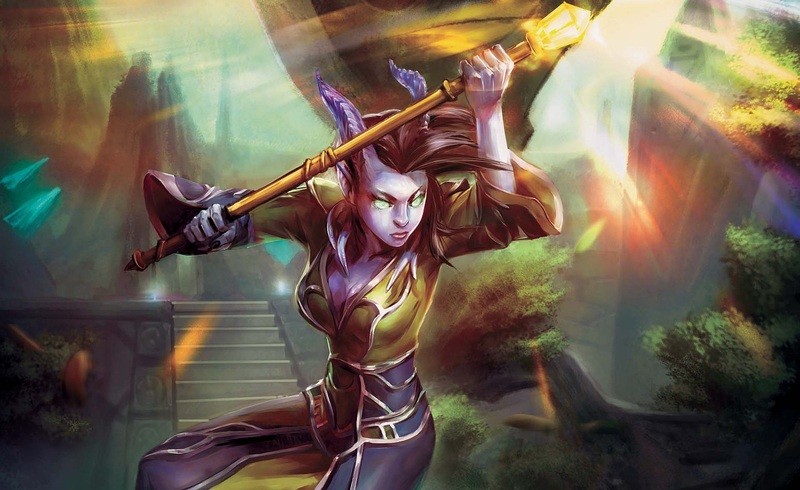 The other two talents still need a little tweaking even after the slight buffs they received earlier from patch 6.1. Void Entropy doesn’t quite fit a criteria for an exciting level 100 talent. There is nothing about it that really screams “I like this talent! I want this talent! It’s so cool!“. Here’s a light one. It’d certainly add a bit more splash to the spell. Have it explode with additional damage every so often. It would be beneficial for any AoE encounters. But that feels a little average right now. What’s next? Okay, that’s a little better. One of the problems I mentioned earlier is that orb starvation is a real thing with Void Entropy and you feel limited in your options. It does mean you’d have to stack as much as you can into your critical strike rating. Good idea but it might fall into the overpowered bin. Not as overpowered and this is much easier to balance. It’s almost a no brainer here and it doesn’t really solve any problems other than making the spell more competitive. Now we’re getting closer. There might be times where you have to focus off to burst down a different target and risk not gaining that extra Shadow Orb. Decisions, decisions! Does that make for better gameplay? Forget the extra DoT. Just have it buff our existing ones. Mind Blast could give you the extra orb. But you lose out on the extra DoT spell in the process which you can swallow because the extra damage can go into the other spells anyway. Your ability to get orbs depends on nothing else but your luck. Tough, eh? Void Entropy should be the spell that DoT casting lovers want to use. Hard to find a way to do that while balancing everything. I’ll put this question out to you readers. How would you like to see Void Entropy improved? Or do you believe that the talent is a lost cause and some other talent should be used instead? Are two priests better than one? I stumbled across an interesting question here regarding the strength of two discipline priests in a raid setting. Traditionally, most groups run no more than one priest. The logic behind that is that discipline priests can’t overlap their shields on each other due to Weakened Soul. Second, while they both contribute greatly to damage mitigation, they are horrible at catching player health back up to a more stable situation. That’s why I like to insist on having a few throughput healers such as a resto druid or a shaman around. However, I find that this logic changes once you reach a certain raid size threshold. My experience is that the magic number is around 12. Once you reach about 25 players, a second discipline priest becomes useful. The two discipline priests can cast twice the amount of shields and double the amount of absorbs going out. Both priests need to have a quick discussion with each other in terms of which priest will be layering which groups. I start with group 1 and work my right while my counterpart opens with group 6 and sweeps to the left. The proposed approach does take some coordination to pull off effectively. One of you needs to ensure that the tanks are covered consistently with shields. What I recommend is having one priest with Clarity of Will and the other running Words of Mending. If you don’t reach that magic number, then one priest is better off switching to holy instead for that extra throughput. Speaking of playing holy, I ended up starting as holy for the first time in years. After playing predominantly discipline throughout Mists of Pandaria and now Warlords of Draenor, the addition of a second priest allowed us that flexibility. My raiding roster currently doesn’t include a resto druid and we’re still on the hunt for one of those to add to our healing team. I found it akin to putting on a pair of old but classic boots. They still fit perfectly though and despite the weathered look, the boots have been dependable. I am disappointed to say that I ended up taking a little longer than usual to get back into the swing of things. Not only that, I was stuck in discipline methods of pre-shielding players. Solution? Put Renew where Power Word: Shield is on the bars and the problem is solved! Chakra dancing can be complicated at first glance. I actually spent most of the night in Chakra: Sanctuary mode and assigned myself to maximum raid coverage while leaving the tanks at the mercy of our holy paladins. I had forgotten how woefully underwhelming Holy Word: Sanctuary is in comparison to those of the other classes. Speaking of other problems, most of my gear was predominantly discipline, with as much invested in mastery and crit as possible. Being holy, I wanted to get as much multistrike and haste as I could, except I blew up most of that gear thinking I didn’t need it. This week’s lesson: Don’t blow up gear that you might not need in the future because you’ll need it. I have one more exercise for you all this week. We’re still well into tier 17 and patch 6.2 isn’t likely to include another raid instance. But let’s say that you have an opportunity to propose and design the tier 18 bonus of your spec. What would you like to see for your spec’s 2 piece and 4 piece bonus? Previous bonuses have included flat throughput and stat increases to certain spells (such as tier 8 and tier 10). Other bonuses have affected the cooldowns of spells (such as tier 12 and tier 14). Have at it! Nothing too overpowered, please! On that note, we’re still looking for a dedicated priest columnist! Drop us a line!